We have come a long way, but there is still a long way to go. That was the message from Dame Vera Baird QC as she unveiled a new exhibition detailing the part played by North East women in the suffrage movement. How Women Won the Vote, at The Word, National Centre for the Written Word, South Shields, celebrates the centenary of some women being given the right to vote. The free exhibition, which will run until 3 May and is supported by Port of Tyne, examines the North East’s history of women’s suffrage and women in politics. And as she officially declared it open (on Friday 23 March), Dame Vera, Police and Crime Commissioner for Northumbria, paid tribute to the women who drove the movement for suffrage. Detailing the brutal punishments often meted out to suffragettes, she told of Tyneside’s Kathleen Brown. 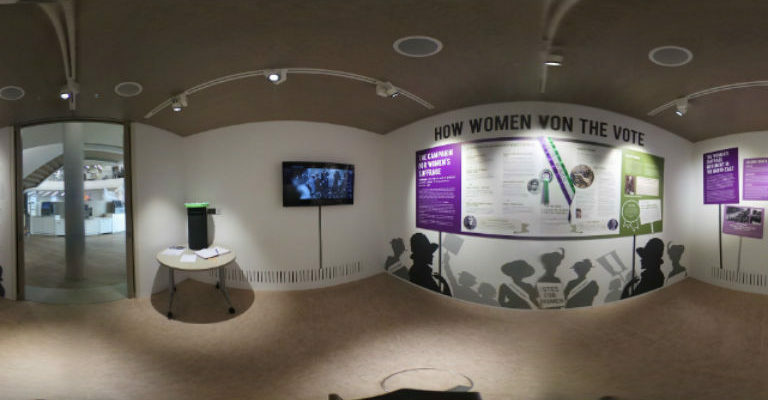 Along with clips and songs from both Mary Poppins (1964) and Suffragette (2015), the exhibition features an unofficial ballot box, where visitors can cast their vote from a list of women featured in the exhibition.